While Kaiserslautern may not belong to the very elite of German football, the club definitely has a varied history. In addition to its four national titles and two DFB-Pokals, the club can also be proud of its rabid and faithful fans. The club's home ground, Fritz-Walter-Stadion, has always been one of the toughest stadiums to play in for visiting teams. The full name of the club is 1. Fußball-Club Kaiserslautern e. V. (the number 1 is refering to Kaiserslautern as the first founded team in town whereas e.V. stands for Eingetragener Verein, in English: registered association). 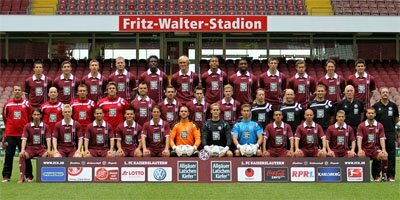 The club was officially founded in 1900, via a merger of FG Kaiserslautern and Germania 1896; the new club's name was FC 1900 Kaiserslautern. In 1909, FC 1900 affiliated with FC Bavaria and FC Palatia in order to form FV 1900 Kaiserslautern. In 1929, this new club joined forces with SV Phönix, but it wouldn't be known as Fußball-Club Kaiserslautern until three years later. Kaiserslautern's rise to prominence came in the post-WWII era, with the foundation of the five regional Oberligas. Kaiserslautern was placed in the Oberliga Südwest, the smallest of the five divisions; during its 18 years in the competition, the club emerged as the winners eleven times. This prosperous period has also seen them go on to win the German championship twice, in 1951 and 1953. While Kaiserslautern did manage to qualify for the first season of the Bundesliga in 1963, the new competition proved to be far more challenging than their old Oberliga. After a couple of decades of mostly lower table finishes, the club finally returned to the football map in the early 90s, with a DFB-Pokal in 1990 and their first Bundesliga title in 1991. They followed it up with another DFB-Pokal in 1996, but the trophy turned out to be a mere consolation prize, as the club was relegated to the second division the same year. Funnily enough, this relegation might have been a blessing in disguise for the club. Under the new coach, Otto Rehhagel, Kaiserslautern started playing composed and energetic football, returning to the top flight straight away. The club then immediately went on to conquer the Bundesliga as well, becoming the only team in German football to achieve promotion and win the league in a single season. Kaiserslautern has used several different logos over the years and along the way, the logo has developed into a more simplified fashion. The current has the number 1 (for being the first football club established in the city) and the club initials FCK (Fußball-Club Kaiserslautern) in white color against a red background.